Party Favors is your one-stop destination for all party supplies. Whether you are planning a special birthday, holiday or anything in between, we have everything you'll need for a festive celebration. 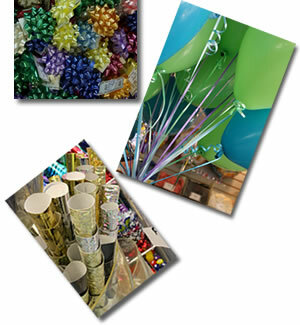 We carry a complete line of supplies, including streamers, balloons, confetti, banners, tablecloths, plates, cups and napkins. We even carry gifts, wrapping paper, stationery, place cards, table numbers, greeting cards and invitations. Favors and centerpieces are available by custom order. Before your next celebration, come visit us at 1356 Beacon St. in Brookline. We're happy to help you coordinate everything you could need for a one-of-a-kind event.